Dory uses her camouflage of species to surreptitiously touch Marlin’s bottom. FINDING DORY is lost at sea. 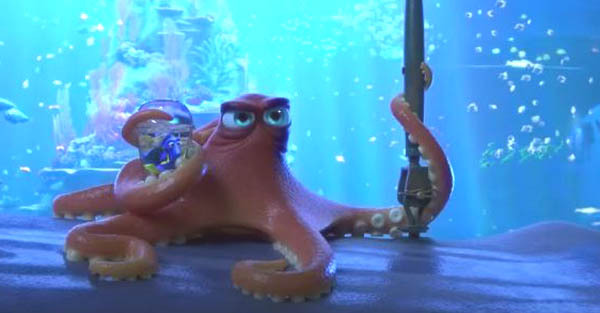 She worked so well as a supporting character in FINDING NEMO (2003) that Pixar spins off Dory’s origin story in FINDING DORY – and only ends up highlighting what a horrifying brain disease she suffers from. 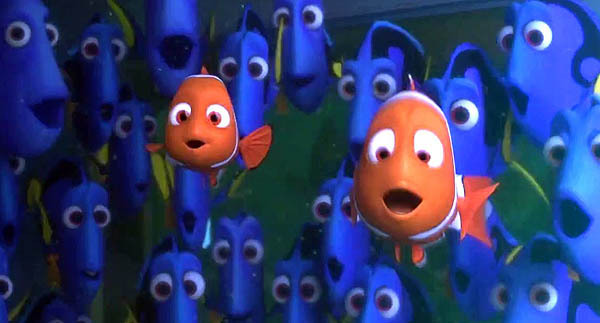 Dory (voiced by Ellen DeGeneres), a blue tang fish with short term memory loss, first appeared in the animated road tale NEMO as comedy relief to Nemo’s father, Marlin. Her memory loss was the driver of many jokes in Marlin’s quest to cross an ocean to find his son. Now, in her own feature, she just comes across as retarded. And not in that inspirational way, where she conquers her disability and triumphs in an orchestra swell. No, the message in the movie is actually: act retarded like Dory and you’ll achieve your goals. Disney, Pixar’s mother company, is renowned for mixed messages, conflicting messages and downright stupid messages, but even I can’t believe how low Disney/Pixar have, uh, sunk. You think I’m exaggerating? When our fish heroes find themselves in jams in the final act, more than once they ask themselves, “What Would Dory Do?” – and find that being impetuous, ignorant and unmindful of consequences actually saves their skins. You’re welcome, Parents. In the movie’s opening scene, while watching Dory’s parents futilely trying to teach baby Dory how to stay away from the undertow, we get the distinct impression that Dory is short a few scales. Since fish psychology hasn’t been invented, these poor fish parents have to live with the fact that Dory is in need of round-the-clock supervision and any dreams they had of travel, relaxation or independence are dashed in being Dory’s constant caregivers. In a tie-in to NEMO, Dory runs across Marlin (voice of Albert Brooks) looking for Nemo (Hayden Rolence). Then their paths separate. Later, Marlin and Nemo would join Dory closer to her goal, hitching a ride with Crush the Turtle again (voice of Andrew Stanton) to the Marine Life Institute in California, where Sigourney Weaver voices the marine park’s announcements as herself. As the journey progresses, the plot jumps the shark with incalculable lunacy, ending up with the octopus actually stealing and driving a truck into the ocean, freeing all the fish within. Don’t even ask. We have to entertain the possibility that the title might refer to more than just the journey of Dory. (In essence, she is not really lost from the audience’s point of view, as we are physically with her all the way.) Is it about Dory “finding herself”? Is it referring to Dory’s parents losing her and trying to find her? (No, because that would’ve been told from the parents’ point of view.) Is it about Dory finding a way to live without them and still be happy? (No. Because she finds them anyway.) Is it about Dory finding a path through her cluttered lost memories to one that makes sense and redeems her? (No, her memory comes and goes as required to move the plot.) OK then… I don’t get it! I don’t get why you would put this hapless fish through this brain-wracking misery in front of craven audiences just looking for a laugh with some animated sea life. And in the end, when everyone is happy and joyous living on the reef again (with Dory’s parents as well! ), what ensures that Dory will retain enough brain power not to wander off again and cause another panic-stricken sequel? You might have found Dory, but you lost me at octopus driving a truck. Directors: Andrew Stanton, Angus MacLane. Writers: Andrew Stanton, Victoria Strouse, Bob Peterson, Angus MacLane. Starring: Ellen DeGeneres, Albert Brooks, Ed O’Neill, Kaitlin Olson, Hayden Rolence, Ty Burrell, Diane Keaton, Eugene Levy, Sloane Murray, Idris Elba, Dominic West, Bob Peterson, Kate McKinnon, Bill Hader, Sigourney Weaver, Andrew Stanton, Bennett Dammann, John Ratzenberger, Willem Dafoe, Brad Garrett, Allison Janney, Austin Pendleton, Stephen Root, Vicki Lewis. Poffy The Cucumber is copyrighted to Jon Dunmore © 1990, and the character and/or his name may not be used without permission. “Poffy The Cucumber’s Movie Mania” is the official website of Poffy The Cucumber © 2005. All movie reviews are the original work of Jon Dunmore and may not be duplicated without permission. © 2005-2016, All Rights Reserved.